On the jagged coasts of the largest island of the Oinousses group, lies beautiful Egnoussa, which faces westwards across the waves of Chios. A nice borough, ornate with high mansions built in the traditional Aegean “island” architectural style, Egnoussa has approximately 800 inhabitants, all occupied with maritime activities. Egnoussa is the birthplace of some major Greek ship owners, who established their maritime headquarters in the great shipping centers of London and New York. The village is perched on the side of a hill. Beautiful winding streets, paved with slabs, lead to the Zepaga coastline, the island’s harbor and the center of local life. During the summer, the harbor of Egnoussa is full of yachts and boats that belong mainly to the natives who left the island to live abroad, returning for vacations and visits with relatives and friends. 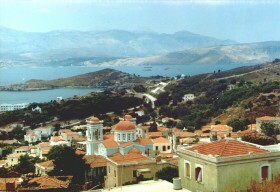 The church of Aghios Nicolaos (Saint Nicholas) is in the center of this island’s settlement, and is surrounded by traditional houses with tile roofs, the pride and joy of the natives.